I usually spend Hari Raya, well, pigging out…=) Lunch time means going to *Umi’s place, for her famous rendang…I was quite upset (boohoo) that I couldn’t make it back this year, but Umie says she’ll cook for me again one of these days! Yay! I had a great time in Chegu’s house…Mrs Nazir is an excellent cook…Her curry mee was stupendous, and the sambal made it better…She was worried we would find it too spicy, but we felt it wasn’t spicy in the least! This is all what being Malaysian is all about, isn’t it? If you’re nice to people and you remember them, they remember you too…It isn’t about being educated or whatever, it is just common human instinct to reciprocate something which makes you feel good, no? Whatever it is, I am sooo looking forward to Umi’s rendang! I sincerely believe that every good deed will be reciprocated one way or another. As for you, I guess there will be more to come!! And I had fun at Cikgu's place that day.Glad you brought me along,dear! Bring me back some rendang!!!! Glad to know you and Ruverny enjoyed Che'gus hospitality and their food. The bonding you had with the Mak Guards is something special and a rarity nowadays.I remember during my student days few of us kampong boys were close with Pak guards and kitchen makciks.Actually we didn't no much for them but whenever we see them we'll call them kakak or makcik or pakcik.But if you are late for dinner or lunch, they'll make sure you don't have leftovers. They'll bring out your tray with the best portions from the cupboard! And you know what? You are the practicing Muhibbah Malaysian. 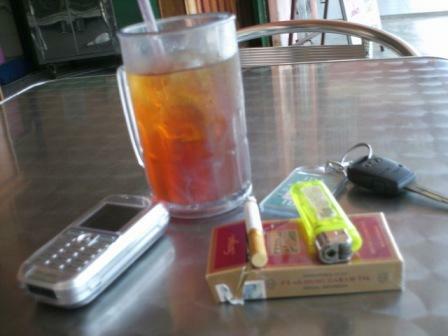 Have a nice break in Ipoh. if i happened to be in penang on raya i wld sure switch on to my tak malu-face and pay him a surprise visit. i'm sure he wont mind and wld welcome anyone. after all its raya, mrs nazir dont have to cook as kuih raya are there and we just need to help ourselves..
Hi Daphne, thanks for sharing your Raya stories. Ya..positive attract positive...u r good to people, people in return are good to u. Vice versa. Chegu KTN, you lucky devil with three beautiful women fully backing you!I am glad you had a good time at Sir's home. Yes he told me about it as a coincidence in one of our posts. My Nepalese guards look forward to roti chanai and teh tarik whenever I return from my twice a week visit to top up. They objected and said that I could do it twice a month...to ensure that the same shift of 6 get equal chances. People who appreciate kindness never take advantage of your generosity. What goes around comes around! Hehe...Simple right? I read your email and I replied di...I saw it the other day, but I was in such a hurry that I thought it was a comment, and not an actual email, since I only saw 'The Razzler' as the sender. And no, I am selfish...No rendang for you! Ah...Mak Guard! I wrote a short piece on one of them guards, Makcik Fazelah for the papers (Star) last year, during Ramadhan...The papers dubbed her 'Mak Guard' too =) Makcik treats us like her children, so we too treat her like our ibu angkat! Ru and I make up the President and the Vice already! But you're welcome to join as Secretary! everybody loves daphne! ;) next time boleh raya kat cali pulak ok?